8/10/12 - Acquisitions - New York, The Metropolitan Museum of Art - What a masterpiece ! 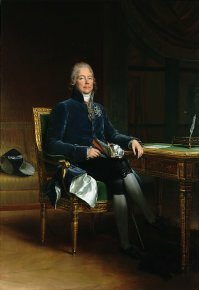 The expression might sound a bit trite but is the first to come to mind when looking at the Portrait of Talleyrand by François Gérard (ill.) just acquired by the Metropolitan Museum from the Wildenstein Gallery in New York. The second is naturally : how did France let such a painting leave the country ? It is immensely important both for its quality as well as the personality it represents. The work was still in France in 2003 after making a detour via Poland (Sagan) and the national museum in Warsaw where it joined the collections in 1947 before being returned in 1969 to the Duke of Sagan’s sister, Hélène Violette de Talleyrand Périgord. She had married a descendant of the famous collector, the Count of Pourtalès. 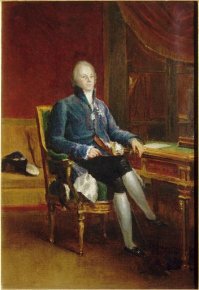 The painting resided at the time at the château de Bandeville in Saint-Cyr-sous-Dourdan, the count’s estate. The Metropolitan’s gain is our loss. Given the acquisition budgets looming ahead, we can be sure that this will be repeated many times over, diminishing French heritage in the future. We can always see the work in New York, except those who are unable or cannot afford to travel. There is nothing so elitist as lowering funds for museums which are a source of enrichment and pleasure for everyone, rich or poor, unlike what many uneducated persons think. This is all the more deplorable since there is a reduced version of this work in Versailles (ill. 2). Much more sketchy, much smaller also, it does not present the exceptional qualities of the large portrait. The work was acquired thanks to a donation by Mrs. Charles Wrightsman.